Maybe it was fate...for sure it was the cruise ship "Destiny"...but this week's postcard is being sent from the rockin' upper deck of our ocean vessel as we complete the final leg of what has been a wonderful 5-day wedding cruise for Steph's uncle Gary and his new bride Penny. We are so privilaged to have been their guests as they exchanged vows on the island of Jamaica just two days ago. Their generosity is overwhelming - they invited 60 members of their family and closest friends to join them for this special cruise in the Caribbean. The trip allowed family members across the country to reunite and reminisce all week long while celebrating this memorable event with the wedding couple. We sincerely thank them for allowing us to be part of the festivities and we wish all the members of the Lubbock Fun Club could be here with us to enjoy the beauty of the islands and this special time. 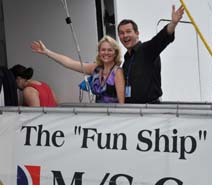 And, as the banner on the gangway suggests, indeed we were "at home" cruising the high seas aboard the "Fun Ship" in style. 'Til next week....know that everything in Jamaica is "No problem, mon"....Grand Cayman is swimmin' in stingrays....and thus far, we've been spared pirates in the Caribbean! April 15….Bob Dorough in Concert - Texas Tech School of Music will host “Schoolhouse Rock” creator and former Plainview native, Bob Dorough for their April Concert. He will be playing a mixture of his jazz and pop-culture careers during the concert. Dorough, born in Arkansas and reared in Texas, fell in love with music after joining the Plainview Texas High School Band. After earning a bachelor’s degree in music in 1949 at the University of North Texas, he moved to New York City where he attended Columbia University and immersed himself in the volatile jazz scene then taking place there – the BeBop revolution. He is known as “the only singer to record with Miles Davis”. While this may not be 100 percent true, he did record two vocals with Davis in 1962 – “Nothing Like You” and “Blue Xmas,” both of which he composed. Davis also recorded an instrumental version of Bob’s classic song, “Devil May Care,” that same year. In 1971 he received a commission to “set the multiplication tables to music.” This led to ABC-TV’s “Schoolhouse Rock” Saturday morning cartoons that entertained and instructed unsuspecting children from 1973-1985. The impact of this media exposure was unpredictably immense. The show came back for another five years in the ’90s and is now enjoying its 30th anniversary with a DVD edition of the entire, five-subject series, for which Dorough worked as the musical director. He has received the Governor’s Artist of the Year Award in Pennsylvania and is a member of the Arkansas Jazz Hall of Fame. Tickets to the event are $12, which does not include a $2 surcharge from Select-A-Seat. For reservations, call Select-A-Seat at (806) 770-2000. Hemmle Recital Music Hall, Texas Tech University; 7:30 p.m.
April 15, 16, 17, 18….“The Sleeping Beauty” - The 40th Anniversary Season will close in beauty, elegance, and wonder with Ballet Lubbock's presentation of “The Sleeping Beauty.” Experience one of the most beloved fairy tales in a way only a full length ballet can deliver. Tickets available for $25 through Select-a-Seat. All tickets are assigned seating. LHUCA Firehouse Theatre, 511 Avenue K; April 15-17, 8 p.m., April 18, 2 p.m.
April 15 -18….32nd Annual Lubbock Arts Festival - This three day celebration hosted by the Lubbock Arts Alliance, will bring the very best visual, performing, and children’s arts to Lubbock and the surrounding area. A theme of “Life, LEGO Art!, and the Pursuit of Happiness” has been selected and will feature a special exhibit, “The Art of the Brick,” which is comprised of 30 pieces of contemporary artwork made entirely from LEGO bricks. Many of the pieces of art are freestanding, three dimensional works each made with more than 250,000 LEGOS bricks. There will also be displays by Texas LEGO Users Group. Every year the Arts Festival features over 150 visual artists from around the nation displaying and selling original work in the mediums of painting, drawing, pottery, fiber, leather, jewelry, glass, wood, and sculpture. A juried and invitational gallery will be available for viewing along with artwork from area school children. There will be different performing stages each spotlighting the very best local and regional talent singing, dancing, acting, and playing instruments. Demonstrations by artists creating their work will take place along with ten different “Kid Stops” providing free art related to activities for children. The “Kid Stops” include ‘make and take’ projects, Art Zone with LEGO bricks, a Home Depot woodworking activity, a chance to perform on the Kids Karaoke stage, Book Fair, and a Kiddie Flatland Film Festival. All of this can be enjoyed for the very low admission of just $2 for adults and $1 for children age 12 and under. Other activities and special ticketed events planned for the 2010 Lubbock Arts Festival include: Premiere Night on Thursday, April 15th, 6 p.m. – 8 p.m., in the Exhibit Hall of the Lubbock Memorial Civic Center. Guests can enjoy the Arts Festival before it opens to the general public. Honorary Chairpersons for the Lubbock Arts Festival, Louise and Robert Arnold of the Helen Jones Foundation, will be recognized. The event will feature Spotlight Artist Carol C. Howell; over 150 visual artists from around the nation in booths; juried gallery; invitational gallery; and local demonstrating artists. Entertainment provided by musicians from the Lubbock Symphony Orchestra. Hors d’oeuvres to be served, cash bar provided. Tickets are $30 (including service charge) available from Select-A-Seat, 770-2000. On April 17th Storybook Theatre of Texas an award winning, professional children's theatrical company will present a new version of the beloved classic about Little Red Riding Hood and the Big Bad Wolf. “The New Little Red Riding Hood” is a fun, family event suitable for all ages. The Texas Commission on the Arts has designated Storybook Theatre as a Masterpieces touring artist, only 1 of 25 in the state. Tickets $12 for adults, $7 for children (including service fee) from Select-A-Seat, 770-2000. This event will take place in the Civic Center Theater at 7 p.m. Also on April 17th from 10 a.m.- 7 p.m. and april 18th from 12 p.m.- 5 p.m. the Lubbock Comic Book Expo will take place in the Mezzanine of the Civic Center. This comic book trade show will hold demonstrations and classes by industry professionals. Event is included as part of Arts Festival general admission. For more details, www.lubbockcomics.com.Lubbock Memorial Civic Center, 1501 Mac Davis Lane; Hours are Friday, April 16th & Saturday, April 17th from 10 a.m. – 7 p.m., Sunday, April 18th from 12 p.m.- 5 p.m.
April 16….America Sings - Dr. Wayne Hinds and the Hallelujah Chorus present an array of Broadway melodies, inspirational favorites and stirring patriotic numbers! Always leaving their audiences with uplifted spirits, the Hallelujah Chorus is bound to fill your heart and soul with their warm, traditional Christian, A Cappella music and beautiful harmonies. Don't miss this stunning production by Lubbock's most loved choir! Tickets: $25, $15 for groups of 20 people+. Cactus Theater, 1812 Buddy Holly Ave; 7:30 p.m.
April 16-17 (repeats April 23-24)….C.A.T.S. Theatre Production: “Men are Dogs” - Doctor Cecelia Monahan is a family therapist who runs a support group for single and divorced women who are trying to come to grips with the way they are treated by the various men in their lives. One member of her group only dates police officers while another had a boyfriend who, unbeknownst to her, was a bank robber. As she listens to the complaints of her group her eavesdropping mother, who lives upstairs from her home office, constantly plagues with unwanted advice on everything from cooking to dating. Cecelia is not above employing some rather unorthodox methods in therapy. She hires a young bartender/actor to interact with her group. Role playing, however, can be quite dangerous in Dr. Monahan's group therapy as a hostile cadre of angry woman beats the unsuspecting bartender senseless. Written by Joe Simonelli and directed by Peter Contreras II. Adult subject matter, parental discretion is advised. Tickets: $10 for adults, $8 for students and seniors. Call (806) 702-0501 for reservations. CATS Playhouse, 2405 34th St; doors open at 7 p.m. and performance at 7:30 p.m.
April 16-18….Lubbock Women’s Club Gigantic Garage Sale – Clothing, shoes, purses, furniture, house wares, dishes, luggage, electronics, home décor, tools, holiday decorations, books, children’s items and more, more, more! This year's sale takes place in the old Albertson’s supermarket building at 6524 Slide and Loop 289. Sale takes place Friday & Saturday from 8 a.m.-4 p.m.; half-price day is Sunday, April 18 from 1-3 p.m.
April 17….Plant Sale & Swap - One half of this event is a plant sale! The Arboretum will have lots of plants for sale that grow well in Lubbock, so if you’re ready to brighten up your yard this is the place to go. There will be some of your favorite perennials, herbs, annuals and even vegetables available so that you can get just what you need for your garden. If you’re already a plant lover, this event is a great way to get your spring plants at great prices – while helping the Arboretum at the same time! All proceeds benefit the Lubbock Memorial Arboretum – a non-profit foundation that works hard to keep the community educated about trees, shrubs and herbaceous plants. And don’t worry if you’re not a “plant person”....seasoned gardeners and horticulturists from TTU will be on hand to answer all your questions and guide you towards the best plants for you and your yard. The other part of this event is an old-fashioned swap meet! Gardeners are usually generous people and are always sharing or trading plants with each other, and this event provides a place to do it on a larger scale. It’s every gardener’s dream! There will be a special area at this event designated for all the plants that people want to share or swap. You are encouraged you to divide plants from your own home or garden and trade them for plants from your fellow gardeners. The more you bring...the more there is to trade! Lubbock Memorial Arboretum, 4111 University Avenue; 9 a.m.- 3 p.m.
April 17….Jason Fellers Presents His Tribute to Tom Petty, Roy Orbison, and Don Henley - Jason Fellers salutes three of American’s most legendary rock singer-songwriters with an astounding tribute to Tom Petty, Roy Orbison and the founding member of the Eagles, Don Henley. With numerous Cactus sell-outs from Jason’s profound tribute to the Eagles, this performance is sure to rock you to your core! One night only! Tickets: $25. Cactus Theater, 1812 Buddy Holly Avenue; 7:30 p.m.
April 17….Baile De Esperanza Para Parkinson’s (Dance of Hope for Parkinson’s) - During April, Parkinson’s Awareness Month, The West Texas Parkinsonism Society ( WTPS), an affiliate of the American Parkinson Disease Association, is joining with other APDA affiliates across the country, to raise money for research to “ease the burden and find a cure” for Parkinson’s. The community is invited to join us for Baile De Esperanza Para Parkinson’s, WTPS’s 1st Annual Tejano Concert, featuring Los Arcos Hnos Pena, Hermanos Arausa, Grupo Tacro Noreno and Grupo Total. Tickets may be purchased at the door. Tickets purchased prior to 10 p.m. will cost $10.00 per person. Tickets purchased between 10 p.m. and closing will cost $15.00 per person. B.Y.O.B. The West Texas Parkinson’s Society is a 501(c)(3) nonprofit organization. One hundred percent (100%) of the net proceeds from the dance will go toward Parkinson’s research. Medicine helps control the symptoms; currently there is no cure or medication to halt the progression of the disease. Come, kick up your heels and know that you will be making a difference for those afflicted with Parkinson’s. If you are unable to attend the dance but would like to help, please send your donation to WTPS, 3610 22nd Street Suite 300, Lubbock, Texas 79410 or call 806-725-0942. Sports Ballroom, 1807 Parkway Drive; The doors will open at 7 p.m.; dance will begin at 8 p.m.